I was not sure of the topic I was going to discuss in this month’s article. As I began going over the front page of the local daily newspaper, the teaser line was “Beloved Police Dog Takes Last Ride”. 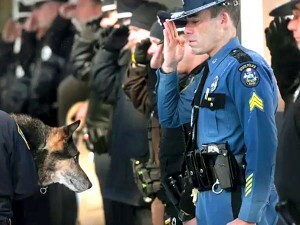 The story is about another real American hero, Sultan the 13 year old German Shepard Police Dog on his last day of life. I will admit that getting into this subject is not easy for me. Dexter our 13 year old Maine Black Dog is having a hard time getting around and the time is getting near that when we have to decide what is the best thing for him. But let me get back to Sultan the Police Dog. Police Dogs lives are not much different that our dogs, they just have a very serious job. Dogs that have been chosen to do Police work live in homes with family’s, have to be let out to do it’s business, go to the vets for check ups, play fetch, chase a ball and do all the things we do with our dogs. Training is the absolute key to bringing out the hero that I believe exists in every dog. When a Police dog dons it’s bullet proof vest and jumps into the back of a cruiser, criminals watch out these dogs mean business. Don’t get me wrong there are dogs all over the world that are doing heroic things without a bit of training and that is what keeps me in awe of our furry friends. Inevitably we come to a point where we have to make an end of life decision concerning our pets. I do not want to seem critical but often times the feelings of the owner keep an ageing pet from crossing that rainbow bridge when they should. So we really need to depend on our veterinarians to help us understand what kind of shape our older dogs are in. Most pet owners know their pet well enough to realize when their dog is nearing the end of life but have a hard time dealing with the thought of being without a friend that has been in their lives for years. Putting these feelings aside and thinking about the pets needs is the best thing for our pets. Our pets can’t talk to us but are able to communicate in other ways, an older dog who whimpers a little when standing up might just need some pain medication, some dogs lose their hearing and figuring that out can be hard but can be dealt with. Other dogs may lose some or all of their sight and its not easy to know how our pet will handle this issue, many dogs are capable of dealing with being blind . Another important thing to watch is their dental health, there are many good products available to help keep your dogs teeth clean and gums healthy. When the time arrives that a decision needs to be made, we need to put our feelings aside and do what is in the best interest of our pets. We need to ensure that our pets are not suffering silently, which means visiting the vet if our older pet is acting out of the ordinary. If they are bumping into things that have been there for years they need to have their eyes checked. Perhaps they don’t respond when you whistle or call their name or don’t come running when food is poured into dinner bowl. In either case extra attention is going to be needed to keep our dogs safe. Losing control of bladder or bowels is a sign of serious issues which may be solved medical treatment. If its an older dog than it may be time to do what is best for our pet. The passing of Sultan the Police Dog keeps me thinking about our boy Dexter who is the same age and has a hard time getting up from laying down, he can still get up it just takes him a little longer than usual. Soon it will be time to make that dreaded decision, one that will be in his best interest. All I have to do is think of all the fun and Crazy things that Dexter and his litter mate Gizmo did who crossed the rainbow bridge last year. I have thirteen years of fond memories with these boys that I would not trade for anything. I would like to express my condolence to Sultans family and thank them for sharing a true American Hero with us. I do not claim to know everything about dogs but through my experience, training and fostering has given me a unique look into The Mind of Dogs. The current pack consists of Dexter the almost 13 year old Maine Black dog, Lady the 6 year old Great Dane, Krypto the 3 year old crazy boy Great Dane, Lilly the sweet little Pit Bull, Tippy the 2 year old Great Dane Foster who is in need of a forever home and Mim the 12 year old very brave cat.